My food affair with Dog-N-Shake started when I was a kid. I’ve grown up on this stuff. As a matter of fact, I’m a third generation Dog-N-Shake eater. My mom’s parents would take her there when she was a kid, and always took me and my siblings there when we were kids. To this day, I remember my go-to order. The #2, Double Dog Deal, Two Toasted Dogs, Large Fries & Medium Drink, all for $6.99. That’s today’s prices mind you, and it’s worth every penny. 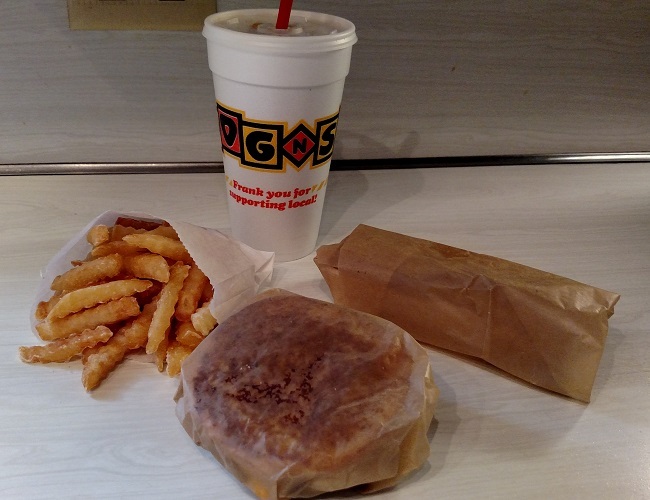 For today, I am reviewing the #7, Hot Dog & Cheeseburger Combo, Toasted Dog & Cheeseburger, Large Fries & Medium Drink. This gives you the full spectrum, and it goes for $7.19. I’ll start with the dog. First off, these are not your typical hot dogs. This also ain’t no Chicago or New York style dog, as Denny would tell you. These dogs are unique. They are unlike anything else out there. You can tell right off that these are beef dogs. They just have that awesome beef dog taste and the trademark red color. They are also cooked in a specific way using a rotating spit. They get just the right amount of caramelization. 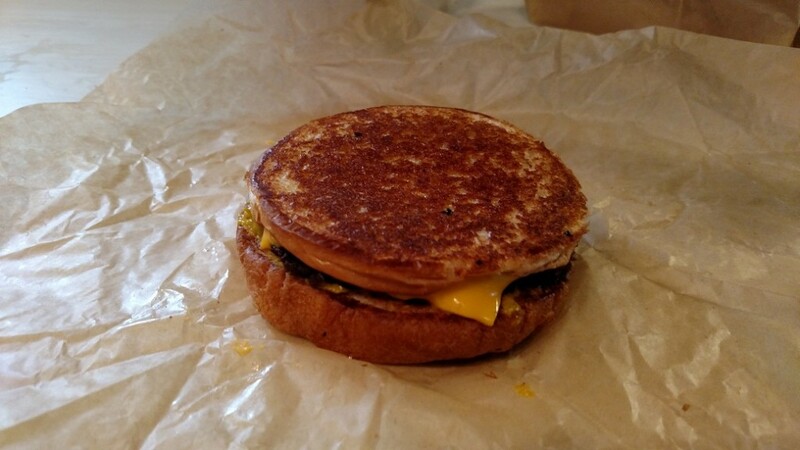 The other thing that sets them apart is the toasted bun, which I think is awesome. It gives it a crunchy texture and also adds flavor to what would just be a plain old bun. To finish it off, they put a little bit of celery salt on top. This is what I would consider the secret ingredient. It brings everything together. Next is the burger. Again, these are a little different than your typical cheeseburger. 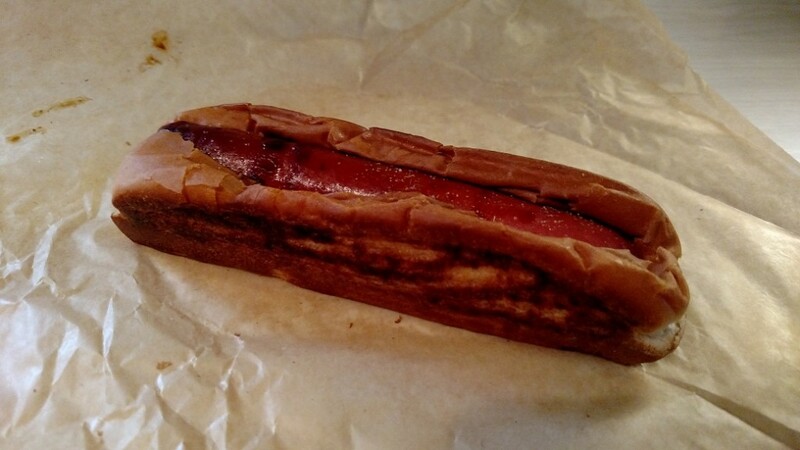 The bun is toasted as with the dog, however the top part of the bun is actually flipped, meaning the flat part is facing up. I don’t know who thought of this, but it makes the burger that much better. Since the surface that is being toasted is flat, the whole thing gets toasted from edge to edge. Again, this adds a distinctive flavor and a decent amount of crunch. The burger itself is cooked on a flat top grill, which again gives the meat the perfect amount of caramelization. The cheese always drips down the side (as it should). All told, this is again a masterpiece in fewd snobbery. One other thing I want to mention, and this goes for both the dogs and the burgers, is the way you order. The default way is with “Everything.” This is just their definition of what should be on a burger or dog. What it means is that when you order it with “Everything”, you are getting a mix of mustard relish (yellow mustard mixed with pickle relish) and chopped white onions. I will admit that when I was a kid, I would not order my dogs this way. I preferred ketchup only. I have since grown accustomed to it. I think it’s part texture again, but it also just tastes damned good. Lastly, I could not review Dog-N-Shake without reviewing the fries. They’re just awesome. They are definitely not your thin, droopy Micky D’s fries. These fries have crunch, and lots of it. The amount of salt is perfect. The inside is still tender and actually has potato in it, not just some empty shell. I’ll also admit that one of my favorite things is if there are a couple of burnt ones in there. If you’ve ever had a bag of potato chips with the burnt ones, it’s just like that. Another thing, and Denny will attest to this, they offer some AMAZING cheese sauce to go on top, if you’re into that kind of thing. 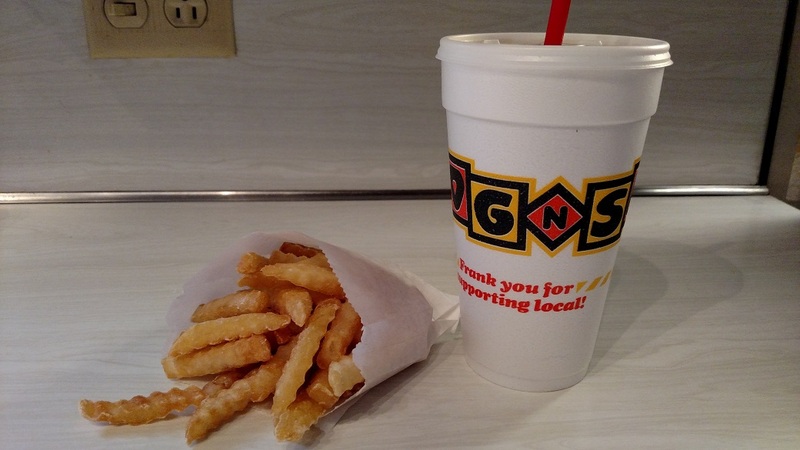 So overall, I think the word that sums up Dog-N-Shake to me is addictive. Once you have eaten there, you WILL have cravings, and nothing else will satisfy. If I ever were to make a list of things that make Wichita great, this would be at the top. If you are from here and haven’t checked them out, I highly recommend it. There are four locations currently around town. If you aren’t from here and are just passing through, check em out. You’ll be glad you did. Ha! I just mentioned Dog n Shake in one of my previous comments. OMGeee! Now I want some so badly!! why do you have to be 1,000 miles away!!! YUM!